Honolulu is shown to be due north of Howland while it actually lies 1,700 miles to the north east. 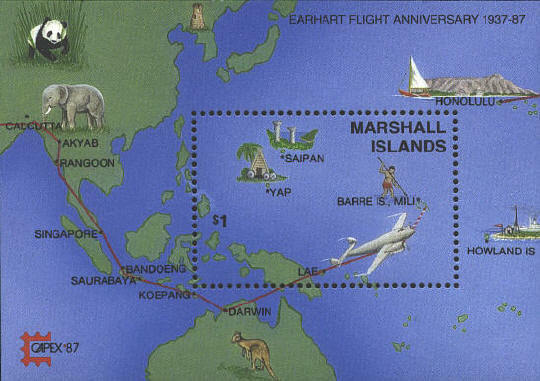 In the upper right corner the red line from Honolulu shows the route of an earlier attempt to circumnavigate the globe from east to west, that had to be called off when the plane was damaged taking off in Honolulu. Because there is also a red line that comes from the left, the impression is left that Honolulu was the place where the circumnavigation attempt began, while, in fact, it began at Miami, Florida and had reached Lae, New Guinea before disappearing on the Lae to Honolulu leg.